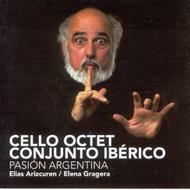 The cello octet Conjunto Ibérico was founded in 1989 by Elias Arizcuren, and is based in Amsterdam. It has performed at concerts and festivals all over the world. The legendary cellist Yo Yo Ma has referred to Conjunto Ibérico as “a treasure indeed, and a fine example to the world of music.... wherever I play people talk to me about the ensemble. Elias Arizcuren is a true visionary who has achieved something absolutely unique with his group”. Conjunto Ibérico’s recordings to date have received a great deal of critical approval. The CD entitled “Four Winds” which was released in 2003 became a “Critic’s choice” in the December issue of the Gramophone of that year. Alberto Ginastera is a true master when it comes to incorporating the folk-music of his country into his works. Pampeana no. 2 (1950) is a rhapsody inspired by the Argentinean pampa and is an exuberant piece, full of virtuosity. In this version for cello-octet two soloists engage in a lively discussion. The Ballet Estancia was never performed as such and in 1943 Ginastera turned it into the concert-suite preformed here. Carlos Guastavino was born in Santa Fé and studied chemistry and music in Buenos Aires and in Europe. His ballet ”Once Upon A Time” and the “Suite Argentina” reveal a style steeped in the rhythms and melodies of his Argentinian homeland. Astor Piazzolla was born in Buenos Aires and studied music in the United States, Buenos Aires and Europe. His vivacious style became known as nuevo tango and attracted a massive South American audience but opposition from tango traditionalists.